Sinusitis is inflammation of the paranasal sinuses, most commonly caused by an allergy or infection. A variety of bacterias may cause acute sinusitis and often develops after something blocks the openings to the sinuses. Such blockage commonly results from a viral infection of the upper airways, such as common cold. During a cold, the swollen mucous membranes of the nasal cavity tend to block the openings of the sinuses. Air in the sinuses absorbs into the bloodstream and the pressure inside the sinuses decreases causing pain and drawing fluid into the sinuses. This fluid is a breeding ground for bacteria. White blood cells and more fluid enter the sinuses to fight the bacteria; this influx increases the pressure and causes more pain. Allergies also cause mucous membrane swelling, which blocks the opening to the sinuses. Additionally, people with a deviated septum are more prone to obstruction of sinuses. Sinusitis is defined as chronic if it has been ongoing for more than 8 to 12 weeks. It may follow an allergy or a viral infection or exposure to an environmental pollutant. Often the person has a family history; a genetic predisposition appears to be a factor. If the person has a bacterial or fungal infection, the inflammation is much worse. Occasionally, chronic sinusitis of the maxillary sinus results when an upper tooth abscess spreads into the sinus. Acute sinusitis usually results in pain, tenderness and swelling over the affected sinus. • Maxillary sinusitis produces pain over the cheeks just below the eyes, toothache and headache. • Frontal sinusitis produces headache over the forehead. • Ethmoid sinusitis produces pain behind and between the eyes and headache, often described as splitting over the forehead. • The pain produced by sphenoid sinusitis does not occur in well defined areas and may be felt in the front or back of the head. In acute type, yellow or green pus may discharge from the nose. Fever and chills also can occur, but their presence may suggest that the infection has spread beyond the sinuses. Any change in vision or swelling around the eye is a very serious condition that can quickly- within minutes to hours- result in blindness. The symptoms of chronic sinusitis are usually much more subtle and pain occurs less often. The most common symptoms of chronic type are nasal obstruction, nasal congestion and post nasal drip. People may have coloured discharge and a decrease in sense of smell. A person also may feel generally ill. When kaphadi doshas lodges in excess quantity in head and then due to indulgence in causative factors of sinusitis, vata dosha increases in head and produces sinusitis. 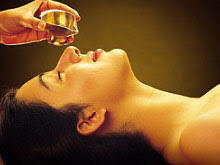 • Panchakarma like Nasyam helps to clear the vitiated kapha dosha from the head. • Herbal medications to balance the increased kaphadi doshas. • Swedana (external fomentation) is to be done quite frequently. • Panchakarma treatments like vamana karma should be done after these if there is evidence of incomplete excretion of dosha even after all the treatment. • Shiro pichu, shirodhara and dhuma varti.